There have been many fulfilling moments in my time as PaCCS’s External Champion, but there was something very special about our recent 6th Form Workshop on “Religion and Conflict”. With the help of PaCCS Leadership Fellows and other luminaries, this event has contributed to changing the lives of over 50 schoolchildren for the better. The wellspring for this event was the PaCCS workshop on “Religion and Contemporary Security Challenges”, held in September 2015, and the Policy Briefing that followed. Alex Benham, our first Communications Coordinator, had already proposed the idea of PaCCS conferences for schoolchildren in her Communications Strategy, and an introduction to The Brilliant Club provided access to pupils who could derive the greatest benefit from this initiative. The Brilliant Club is an award winning charity that exists to widen access to universities for pupils from under-represented groups. They recruit, train and place doctoral and postdoctoral researchers in non-selective state schools across the country. Five schools were involved: Bushey Academy (Bushey), Fortismere School (Muswell Hill), Greenshaw High School (Sutton), King Solomon Academy (Marylebone), and St James Catholic High School (Barnet). Each sent about a dozen 6th Formers to our workshop in Camden Town, with the venue generously provided by the Open University. The day was structured around two big questions – “How does religion become entangled with conflict and violence?” and “Is there anything we can do about it?”. Through a series of parallel round-table discussions and plenary feedback sessions, we explored a number of sub-themes: identity and difference; trust & mistrust; insecurity and alienation; closed minds and stereotypes. In reporting on his round-table’s discussion about “Alienation and Belonging”, one pupil stood up in front of the plenary and described his experience of feeling alienated as an Asian, a Christian and – to round things off – a supporter of Donald Trump. This last point was met with gasps of shock, mutterings and laughter around the room. Immediately, the pupil sitting next to him stood up and announced to the room: “Your reaction has just shown us alienation at work.” This coup de théâtre, worthy of the great Luigi Pirandello, was met with a moment of stunned silence, as the penny dropped. Job done! We placed one serious obligation on all the pupils. When they get back to their classrooms, each is to compose one or two paragraphs – to be used in the Personal Statement accompanying university applications – describing what they did and what they gained from the day. (Thank you, Zehra Jaffer, for this brilliant suggestion). That way, the day delivers an enduring legacy. 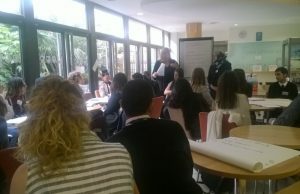 As we brought proceedings to a close, several schoolteachers urged us to think of taking this workshop “on the road”: arguing that many 6th formers would benefit from being able to participate in an event like this. Realistically, it would be too much to expect the hard-pressed professors and facilitators to make themselves available to contribute on a regular basis. But the Brilliant Club’s model typically involves doctoral or post-doctoral researchers in delivering knowledge to schools around the country. We realise there would be logistical challenges to be overcome, but if there are any early-career researchers out there interested in exploring this idea, do contact me (tr356@cam.ac.uk) and I’ll see what can be done.